Morels are happening! We’ve had some nice rain the last few weeks. The morels are popping up. This might be a good year and a good season to look for these easily recognizable world class gourmet mushrooms. (Take a field guide with you). It is often said that they emerge about the time the mayapples emerge. Over the years, the first place we usually find them is around our bee hives. Morels are associated around here with tulip poplars, ash, dying elms, and old apple orchards. They are sometimes found in great numbers after a forest fire. 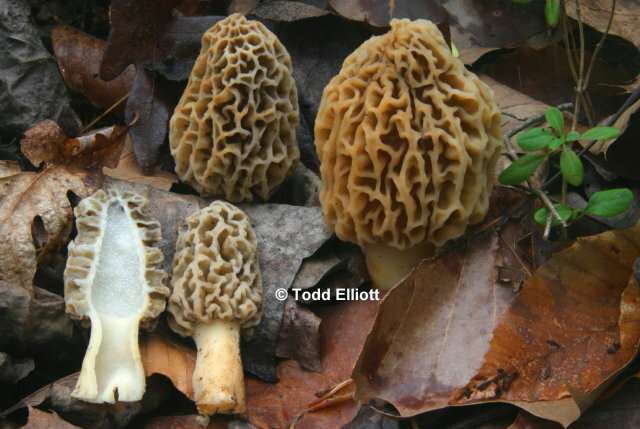 Morels are both saprobic (decomposing dead organic matter) and mycorrhizal, meaning they also connect to live plant roots in a more or less symbiotic relationship, where the fungus gets sugars and nutrients from the plant while providing the plants’ roots with a greatly increased absorptive surface area by extending mycelia out into the earth. This enhances the plant’s ability to derive nutrients from the soil. I have been reading (and writing) about mycorrhizae for decades but I had never actually seen them. Last summer my son, Todd, sat in on some graduate level mycology classes at Duke and at the Highlands Biological Station where they did extensive microscope work. So last week, when we were digging holes to plant muscadine grapes, and Todd unearthed a mass of mycorrhizal rootlets, we prevailed upon him to show us how to examine them with the microscopes. First at 70X we looked at the uninfected rootlets that were covered with root hairs. Root hairs are large single cells that form the primary absorptive surface of the plant roots. Then we looked at the engorged mycorrhizal rootlets (that looked like tiny twisted balloon creatures) He cut a tiny section of the rootlet, dyed it, pushed a cover slip on to it and when we looked at it at 700x. We could see the microscopic hyphal strands that penetrate between the cell walls of the rootlet and extend out from the surface. These are the parts that grow out into the soils and become part of the great mycelial web that is a primary component of the “fabric” of the earth– essential strands in the web of life. There’s a lot going on beneath our feet!